CEDAR CITY – Less than 10 days prior to Utah Highway Patrol’s 10-pound drug bust Sunday on Interstate 15, a newly trained Cedar City Police K-9 aided in the discovery of 12 pounds of methamphetamine in the spare tire of another vehicle traveling on I-15. On March 12, during a routine traffic stop around 7 p.m. on northbound Interstate 15, near milepost 51, Utah Highway Patrol Sgt. Ryan Bauer spoke with Juan Pablo Sanchez, 30, of Santa Ana, California, who told the sergeant he was just traveling to Colorado. However, Bauer said something about Sanchez’s demeanor and inability to easily answer simple questions made him suspect there was more going on than a simple road trip. Sanchez’s demeanor prompted Bauer to request K-9 assistance. 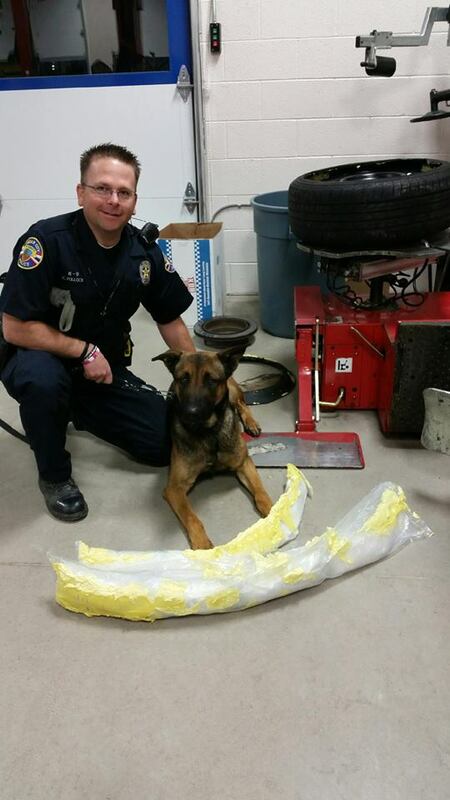 Newly trained Cedar City Police K-9 Duco and his handler, Officer Clint Pollock, were on the scene within ten minutes, and it wasn’t long before Duco indicated there were drugs present in the vehicle, but a thorough search yielded no results at first. Concentrating on the specific areas where Duco alerted to drugs, Bauer said he realized the spare tire had more than just air in it. 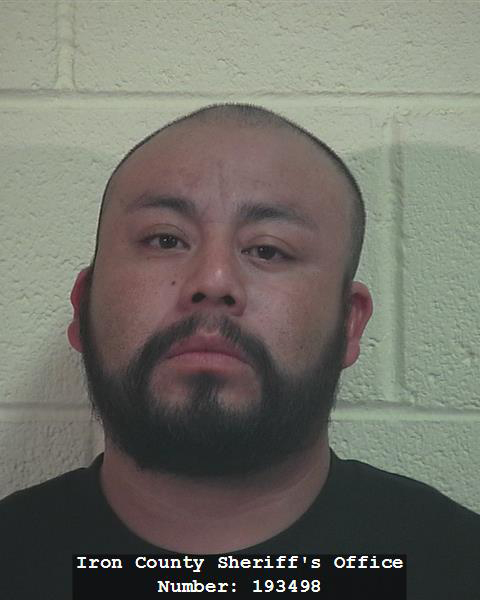 Sanchez was arrested and booked into the Iron County Jail on March 13 where he remains on a $30,000 cash-only bail while authorities continue to investigate leads attempting to locate the drug source. The case has been turned over to the State Bureau of Investigations and the assigned Iron County Drug Task Force agent and the DEA, making it a federal investigation, because Sanchez crossed state lines while transporting the methamphetamine. Bauer said there is no question in his mind that without Duco’s help, the drugs may not have been found at all and Sanchez would not be in custody. Pollock said there are a variety of creative hiding places that drug runners use to smuggle drugs. Many of those areas, he said, such as door panels and hidden compartments, are easily found. However, some areas are more difficult. Pollock said with the help of a K-9, he once found drugs welded into an air compressor unit; an impossible feat without the help of his four-legged friend. Duco is the second police dog that Pollock said he has worked with in his 10 years with the Police Department. He said his first dog, Voodoo, unofficially retired when Duco graduated from the K-9 training program in December 2014. The training program is 8 weeks of intensive instruction that teaches everything from scent memorization and differentiation to obedience. The K-9’s are taught to smell for marijuana, cocaine, heroin and methamphetamine, he said. Some of each drug is hidden throughout the course without the handler’s knowledge of where they are. Then the handler and his dog traverse the course sniffing out the substances. Holy cow! We have some drug traffickers….notify FBI, this stuff has to be coming from Mexico. Go Duco! Dang tweek dealer. Mr. Sanchez is likely not the dealer, but simply the pack mule.